Specific guidelines are available for the management of potential exposures to microbial agents. When an individual has contact with a microorganism, there must be prompt attention at a health care facility. This intervention lessens the possibility that one may acquire the infection [1, 2]. A common scenario is the occurrence of a wound. Naturally, there is risk that infection may develop. The application, therefore, of antimicrobial agents after one has washed the lesion with soap and water is beneficial in order to keep the situation under control . Moreover, debridement of the wound may be necessary . Pregnant women who may have acquired something of this nature require careful management. First, the physician has to control it while at the same time avoid placing the fetus in danger of harmful effects from medication . There are risks and benefits for the management of these women, and one has to assess all of this in order to afford a good outcome . Nevertheless, clinicians generally agree that all of these situations require prompt evaluation and treatment. As with any medical presentation, these clients require a thorough history and physical examination as those tools will likely lead the medical doctor to an accurate diagnosis [1, 2]. The physician must consider several variables before the initiation of postexposure prophylaxis. These include safety, toxicity, cost, and efficacy of the medication. There may also be resistance to the antimicrobial agent as well as interaction with other drugs that the person is taking . The ability of the patient to comply with the treatment regimen is an important issue. For example, women who have suffered from sexual assault tend not to follow through with office visits and medication regimens. This may have to do with psychological trauma which they have experienced . Paradoxically, compliance for them is essential because they may have experienced vaginal bleeding and trauma during the assault. This increases the risk for human immunodeficiency virus infection which the perpetrator can transmit to the victim . There has been much progress with the management of exposure to microbes, and good medical evaluation in conjunction with communication will yield the best result. Bader, M., Brooks, A., Kelley, D., and Srigley, J. (2017). Postexposure management of infectious diseases. Cleveland Clinic Journal of Medicine, 84, 65-80. World Health Organization. (2017). Post-exposure prophylaxis. 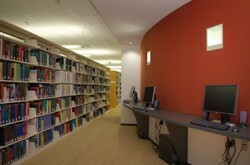 The photo shows a library at the U.S. Centers for Disease Control. Reprinted with permission of that organization.